Having an Indian herb and spice grinder to hand in the kitchen can ensure that your meals are bursting with flavor. 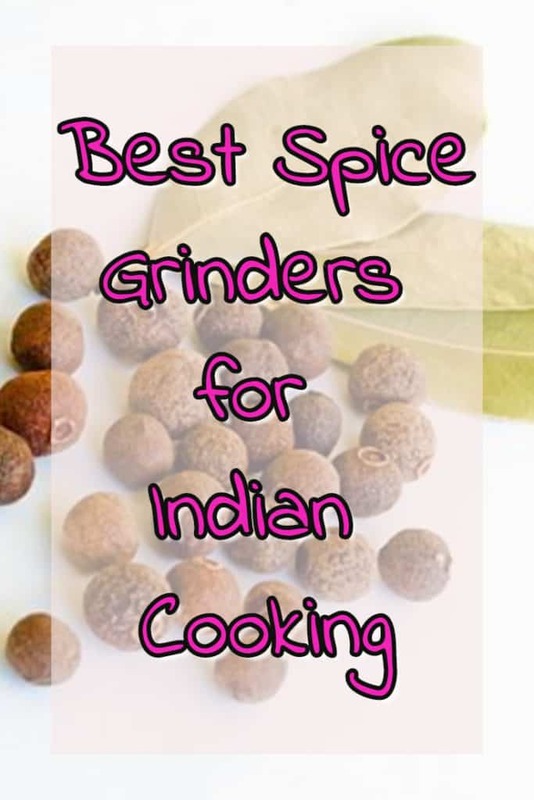 If you love spicy foods then a suitable grinder is a must in any kitchen. Spices such as whole coriander or cumin, have much more taste if you buy them whole and grind them yourself fresh whenever needed. Ready made powdered spices soon lose that just ground flavor that the best Indian cooks rely on. Another tip to extract the most flavor is to gently toast the herbs and spices just before they are ground. Best Electric Herb and Spice Grinder for Home Use Recommended! I love this spice mill, I have owned the same type for years. I use one just for grinding Indian spices and I have a separate one for grinding coffee beans. It reduces whole spices into a fine powder quickly. I wouldn’t like to work in a kitchen without one! It is so simple to use just fill up the top of the grinder with whole herbs and spices then pop the lid on. When you depress the lid the grinder starts up, it then stops when you move your hand away. An added advantage is it is small and light so is easy to store in a cupboard until needed. The Cuisinart SG-10 Electric Spice-and-Nut Grinder is not a hand-held version. It’s a little bigger than those smaller designs. However, it’s just as easy to use as a hand-held grinder is and it can hold more yield than the smaller grinders can. This one has powerful stainless steel blades that make short work of either dry spices or nuts. They can grind through either in seconds. The motor is durable and heavy duty and operating the gadget is straightforward. When you want to use it, you just load it with your ingredients and then gently press down on the top. It immediately starts grinding. When you’re done, you just lift your hand to remove the pressure and the machine stops. You can choose to grind in coarse or fine yield. The way the finished product turns out is determined by the length of time you press the top of the machine. When you want your herbs to be finer, you simply hold the top of the grinder down longer. The work bowl is stainless steel and has a separate lid so once you’re finished whatever you’re grinding, you can put the lid on and it’ll keep. This bowl is dishwasher safe. The Golden Bell 4 Piece Spice Herb Grinder is an inexpensive model that is made of tough zinc alloy which means that it’s built to last. There are four parts to this grinder. You get the top, the grinder piece itself, the screen and then the bottom. The lid and second piece of the grinder stick together thanks to the magnetized lid. So if you drop it while it’s loaded with spices, it won’t spill them out all over the counter or floor. The grinder can quickly turn whatever spices or herbs you put into it into a product that’s usable for your recipes. All you have to do is load the grinder and then give the top a few twists. The third part of the grinder, the mesh screen filters what you put in and leaves you with fine herbs and spices. The mesh screen works so well that all that drops to the bottom of the grinder is a very fine pollen and you can remove that from the screen and the grinder using the pollen scraper. This gadget is extremely handy to have in the kitchen and is hand held size so it’s portable. Another grinder you’ll want to take a look at is the KingTop Herb Spice Grinder. This one has a 3 inch diameter so it’s easy to grip. It’s made of zinc alloy which is a tough material and will make the grinder last for many years. There are four pieces to this gadget and they are the magnetic lid, the grinder, the pollen catcher screen and the bottom. It has 45 teeth in the grinder which quickly works to produce a small batch of whatever product you’re grinding without leaving behind pieces that are too big to use. Grinding the herbs or spices or even loose leaf teas is really simple. Once you load it, all you have to do is give it a twist. Using this kitchen tool is a great way to save money on the cost of herbs and spices as well as use what you produce in your meals. It can make produce as much or as little yield as you’d like it to. Sometimes you need a grinder that can cope with a wet curry paste. For example, some Indian dishes need to start off with a wet mixture of spices, herbs, onions, ginger and garlic. This machine would be perfect for that job.